What was the inspiration behind Waterloo Guitars? BC: I've always been infatuated with guitars. Guitars of all kinds. Not just the expensive ones. When I first started working on guitars, there was always the holy grail. It was usually a mid-30s Martin or Gibson that people were after. It was never the ladder braced guitar or the off-brand guitar, but there was always something intriguing to me in those cheaper guitars from the 20s and 30s. You could pick them up and they had character. The problem was that they rarely played well. If they had played well, a lot of them would still be played today. But since they didn't, these are the guitars that got put in a closet or shoved away in an attic somewhere and forgotten about. You have to remember that, during the depression, the majority of guitars were sold through mail order catalogs under all kinds of different sub-brand names built by the major guitar companies of the time. They may have been a fraction of the price of the company's main brand, but they were what people could afford and what the companies did to stay afloat. The guitars had simple appointments and weren't built from the most gorgeous wood. They didn't sand the braces. They didn't clean up their excess glue. They were made quickly and were all about function. Some really great guitars were made that way and these were the guitars that ended up in the hands of the influential players of the day. Right now, I think there's a rebirth of different guitar sounds and tones. People love guitars and all their factions. Every which way there is. I wanted to bring back the voice of some of these old depression era guitars in an instrument that would actually play. There's an awesome space there to explore and enjoy. What is it about this specific sound that intrigues you? BC: There's a certain rawness to it. It's a sound that has grit. There is a lightness and an unrefined quality that you rarely find in guitars being made today. You have a quick, dry attack, but there's also an unruliness to it. Some of that will develop over time as a guitar matures, but a lot of this sound has to do with the bracing and design. A lot of luthiers today try to tune out the nuances of a guitar, and there is definitely a place for that, but I don't think a guitar needs to be completely balanced and even from end to end to be a great guitar. Some of the notes may be the guitar's best and some may be the guitar's worst. It may not be the same voice from one end of the instrument to the other, but there's a use in that guitar. Some might say it's what gives a guitar character. Where do you think all of these great guitars from the 1920s and 30s ended up? BC: Most of the guitars fell out of existence because they fell apart. Weather and environment were a big part of it. People didn't understand how hard they could be on guitars. Also, the less expensive guitars didn't usually come with good cases. If a company's main brand guitar was $70 back in the day, the off-brand guitar might have been $15. The person buying the $15 guitar was not going to spend $15 for a case. They spent $2 for a cardboard case. Then they went and lived somewhere in the world where there was no air conditioning in any house anywhere. That was the 30s. The guitars most likely ended up in a harsh environment in either the winter or the summer. That's horrid on guitars, especially if there's no case to protect it. Most of them just dissolved and the guitars that did survive all ended up needing major repair work. Some of them probably ended up as firewood. Did you have a certain type of player in mind when creating the first Waterloo? BC: The first player I had in mind was a fingerstyle blues player, especially with the ladder braced guitar. That was the first style I built and my initial idea for the guitar. But as I made more guitars, it became clear that there was a lot more potential for the guitar beyond fingerstyle. We decided to try an x-braced version for comparison and ended up liking it just as much. It turns out the x-braced version is also great for fingerstyle and both guitars can handle all sorts of playing styles. How much did price factor into your decision to create Waterloo Guitars? BC: The price came about more as a result of the sound I was after, rather than trying to hit a certain price point. Making a guitar that is accessible to more players is a good thing, but that wasn't the reason I wanted to do it. The goal was to capture a particular sound by making the guitars like they were actually made back in the depression, and that meant stripping the process down to the bare essentials. "I wanted to bring back the voice of some of these old depression era guitars in an instrument that would actually play. " The challenge was to figure out how to put less hours in the guitar and still make it a great guitar. The hours that do go in it are very skilled hours, but it's probably one third of what it might take to build a very high end guitar where you obsess over every detail. This means you don't clean up your glue mess. You don't worry so much about sanding the braces. You forget about trying to make a guitar with a mirror finish. You put craftsmanship in the guitar, but only where it really matters. It ends up being a no-frills utilitarian guitar, but the tone and the intrinsic value are still there. I knew going into it that it would be a departure from Collings Guitars, but it was an area that I really wanted to explore. Not all of today's players have seen these old guitars. Not everyone is searching for them, so they're not finding them. I think people are missing out on something unique and different. Some of the originals are out there, but they are really hard to find in good shape. So much so, that you will usually have more cost in the repair work than the cost of a new guitar. So having this guitar at an affordable price allows you to get some of that Americana history in a newer instrument that will last a lifetime. The lifetime of most of the originals is over, unfortunately. What's your take on ladder bracing vs x-bracing? BC: Ladder bracing is more responsive and somewhat more articulate, yet it also has a wildness about it that makes it really interesting. The tone is less focused, so it blends together in a way that you could never get from x-bracing. You also get strong midrange and a nice thump out of the bass notes. The tone of the x-bracing is more balanced and defined with a clearer bass register. It may be a little better for chords or strumming and things like that. They're both great, just two distinct tones. We find that the preference for one over the other is about 50/50. Did you consider having the guitars made overseas? BC: Never. It had to be made in our shop so we could control the sound and make it how it's supposed to be. If it were not made in my shop, it would not be the same guitar. It's that simple. It may take less labor than a higher end guitar, but it's still skilled labor from people who understand what it takes to build an exceptional guitar. 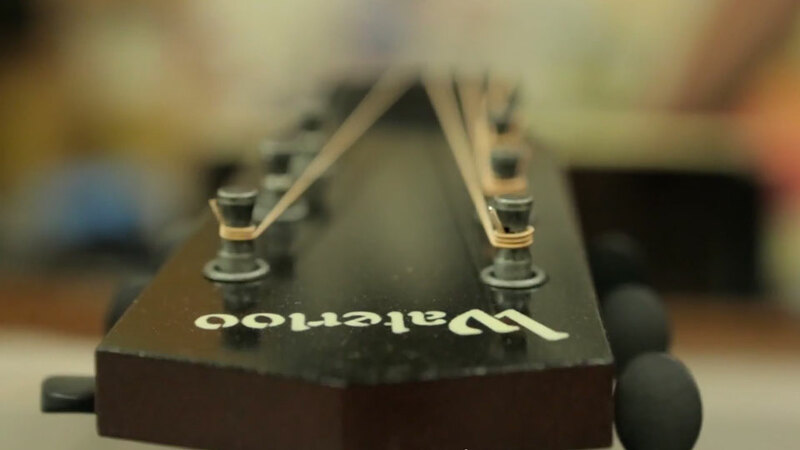 Playability, balance, exact geometry, and other things are needed to make a guitar work. Those have to be the basics of a guitar, but they are not basics of a guitar normally made in a large overseas factory. BC: I see Waterloo as a vehicle to explore lots of different avenues of wonderful guitars of the past. There's a lot of potential there. What's next? I'll let you know when I figure it out.
. Get in the Loop .